I'll be honest with you guys, I am not ready for Fall. I mean this has probably been the best summer me and my little family have had yet and I am not ready for it to end. I know, I do still love Fall. It's one of my favorite seasons but I'm holding onto Summer just a tad longer if you will. Even with me holding on to the warm weather, retailers are already selling cool weather pieces. Nothing wrong with that, in fact I've been kind of searching for a few key pieces for when it does get colder. And while searching, I've noticed that I've been leaning towards one particular color. Can you guess what it is? Pink of course! 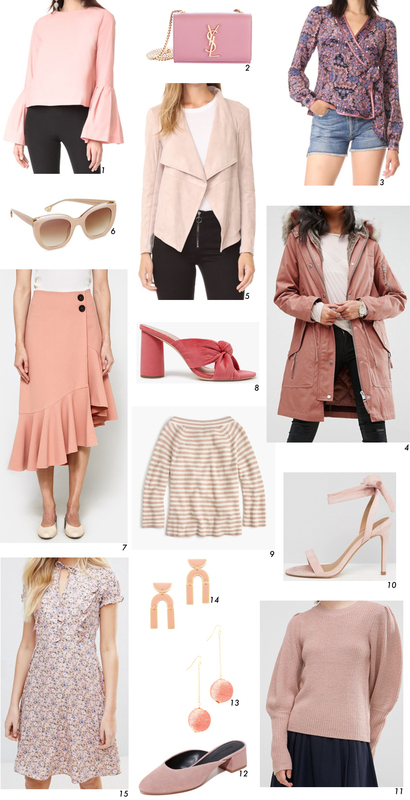 I just think the color pink is so flattering, a great neutral, and an instant mood lifter (at least for me). So can you blame me for loving this color? I've got that parka in my cart, I just think it's such a great color for a parka. You see them in green a lot, and there's nothing wrong with that. In fact, the one I wore all the time last year is in green. But having it in that blush pink is so different and will really keep things happy when its cold outside. And I really believe that if I had those heels, I wouldn't have a reason to be sad. Right? I've also been looking for a new pair of staple sunglasses, and I really am loving these ones right now. See any favorites that you'd want to get before it gets colder?